The DS4 Wireless Controller features familiar PlayStation controls, and incorporates several innovative features to usher in a new era of interactive experiences. Its definitive analog sticks and trigger buttons have been improved for greater feel and sensitivity. A multi-touch, clickable touch pad expands gameplay possibilities, while the incorporated light bar in conjunction with the PlayStation Camera allows for easy player identification and screen adjustment when playing with friends in the same room. The addition of the SHARE button makes utilizing the social capabilities of the PlayStation system as easy as the push of a button. The DUALSHOCK4 Wireless Controller is more than a controller; it’s your physical connection to a new era of gaming. 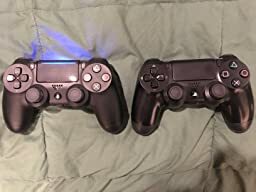 I have gone through two Dualshock 4 new model controllers, one that came with my PS4 Pro and a second one I ordered a month later when the first one developed issues with the left analog stick. Now my second controller is showing the exact same issues. The symptoms are that at some specific angle, in my case at the very least slightly to the left or right of straight forward, the stick will not respond properly. This will result in the game character for instance suddenly slowing to a walk from a run and back again, resulting in very stuttery movement. And over time the issue will get worse, with larger deadzones. Sony will replace the controllers under warranty within one year, but the warranty process is inconvenient to say the least. You have to mail the controller to them, and you might not get it back for two or three weeks. Without a controller, the Playstation system is unuseable. There are several guides out there that detail how to replace the sticks yourself, but they require cracking the controller open and desoldering the stick to solder a new one in its place. When the stick is behaving normally the controller is great, but with two in a row going bad like this I will be looking into a third party controller for sure.